Spring is here, but it seems like it is coming at us two steps forward and one step back. Last week the thermometer climbed back to a temperature that my garden seemed to love and then the clouds and fog rolled in. 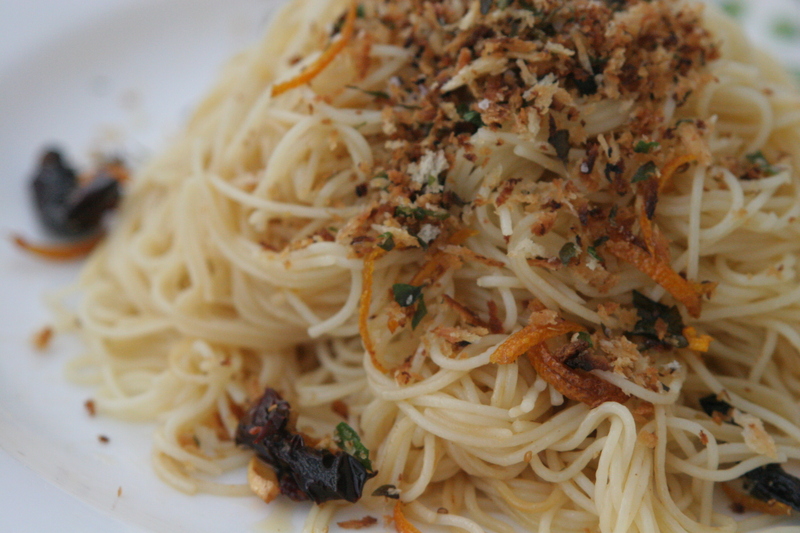 Today it is raining, but I do not mind because I’ve got pasta al sole to warm me up. This is a pasta recipe from my Piemontese relatives (although no doubt southern Italian in origin), that makes me smile this time of year. It is a pasta that harnesses the sunshine so it is ready whenever you need it. While my relatives never overtly linked the oranges of this recipe to the those thrown in the Carnevale d’Ivrea, I nonetheless think of the crazy, medieval, pre-lenten, annual festival that takes place in Ivrea. You can read more about it here, but imagine riotous, happy people dressed as uprising peasants with red caps, pelting “the man” (i.e. re-enactments of an evil duke and his minions) with rock hard Sicilian oranges that are shipped north by the trainload each year. I remember spending a wonderful week with my Eporediese family, reveling in the traditions, enjoying the “fagiolata” (a communal bean-stew-eating day), and massaging my poor bruised body, still fragrant with orange pulp. I hope you too might be able to visit this amazing place one day, should you ever visit Italy. In some ways, April is one of the bleakest months of the year for produce at the markets. Winter vegetables and fruit are just coming to an end and it is way too early for spring gems like local organic strawberries. 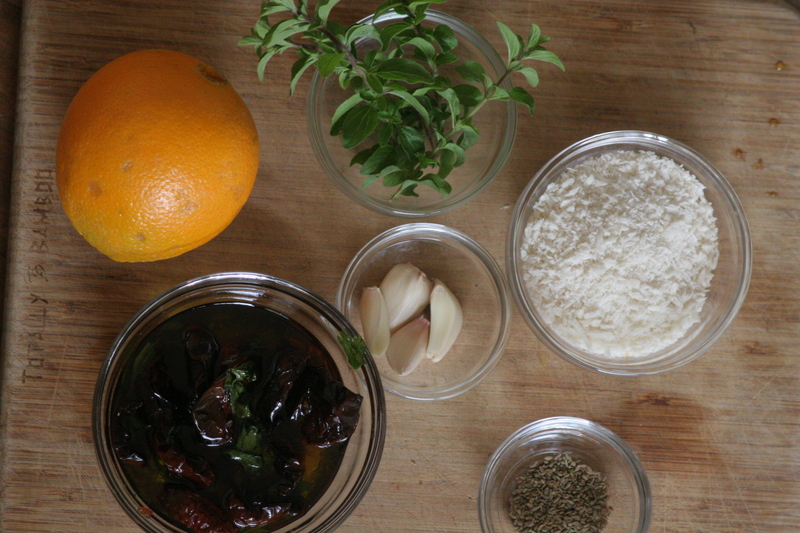 This pasta uses the last of your market’s citrus (clementines, blood oranges, minneolas–anything in the mandarin, tangerine, or orange family is fine) and what you bottled from summer (if you make homemade sun-dried tomatoes like me) so in a way, it is an utterly seasonal April pasta dish. (Having said that, my favorite way to make this dish actually includes zucchini which is not in season right now, but you can adapt it and add julienned zucchini as soon as the first young vegetables show up). Another unique touch in this pasta, which incidentally completes a perfect vegan pasta, is the poor man’s cheese. 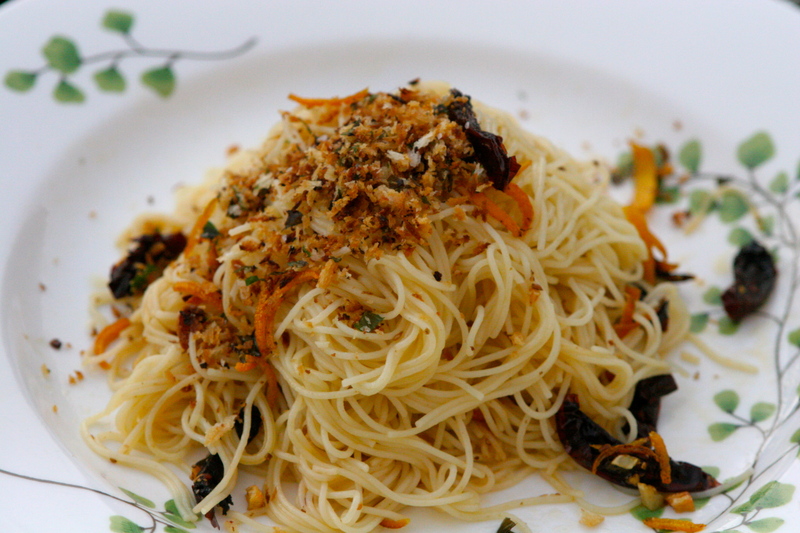 “Formaggio dei poveri” is simply oil toasted bread crumbs with whatever flavoring you choose to add. I like a tiny bit of crushed garlic and some fresh oregano. It tastes like crunchy crushed garlic bread. This is a great pasta to serve at Easter brunch or dinner since it tastes great piping hot or room-temperature. As with my other posts, I recommend toasting your seed spices, here fennel seed, ahead of time and then crushing it in a mortar and pestal before adding it to your olive oil. If you have homemade or special sun-dried tomatoes, I recommend using them in this dish. They are nothing like those pre-sliced sun-dried tomatoes that were paired with pesto (ugh) of the 80s and 90s. (Sorry folks, I seem to have a vendetta for dishes with pesto and sun-dried tomatoes.) I plan on doing a post on how to do your own sun-dried tomatoes in the August or September when I come across more of Mariquita’s amazing Early Girls and San Marzano tomatoes. Finally, your orange should be organic simply for the fact that you will be eating the peel in your dish. Make sure it is free of wax and pesticides. Look out tomorrow for a classic Italian Easter bread covered with almond paste and sliced almonds. 1. Boil the water for your pasta. 2. 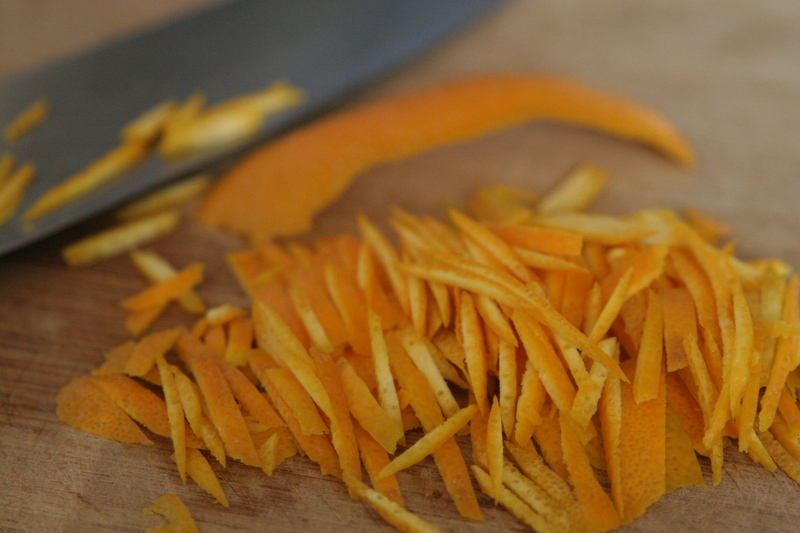 With a vegetable peeler carefully peel strips of your orange without removing the white of the orange. Stack the fat strips on top of each other and then, with a sharp knife, cut long, tiny strips at an angle so they are about 1-2 inches long each. 3. In a frying pan heat to medium low. Add the fennel seed until it just barely changes color and smells fragrant. Pour out hot seed into a mortar and pestal or a cutting board where you can crush them with the back of a sturdy cup. 4. Add olive oil to frying pan at medium low. Mince 4 cloves of garlic and fry for a minute. Add the sliced orange zest, crushed fennel seed, (juliened zucchini if using here), and then the strips of sun-dried tomatoes, taking care not to add too much extra oil from their jar. Turn heat to low. 5. Cook your pasta. While it is cooking heat a separate pan on medium. Add the final clove of garlic, crushed this time, for 30 seconds. 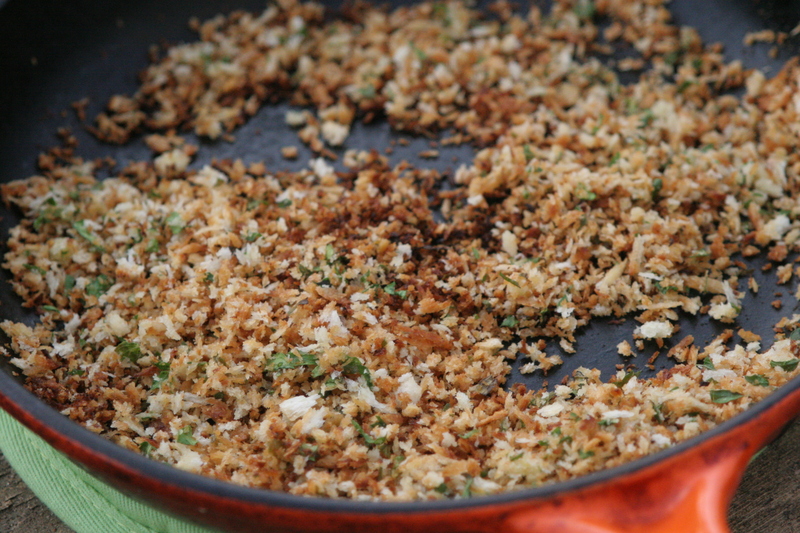 Add the bread crumbs/panko and cook for 3 minutes or until crispy. Add the fresh shopped oregano and cook another minute. Pour out the “poor man’s cheese” into a bowl to stop the cooking. 6. Drain your pasta, toss into the sauce in the frying pan. After you have served each person, pass the bread crumbs around for people to add, and if you must overdo it, as I clearly must, add Pecorino Romano or Parmigiano as well. This entry was posted in Pasta, Vegan and tagged pasta al sole, pasta with orange and sundried tomatoes, poor man's cheese, sun pasta, vegan pasta with sundried tomatoes. Bookmark the permalink. Vegan pasta? I’m sold…I also love the “poor man’s cheese,” which over here, with your permission, we will rename “allergic man’s cheese.” Brilliant. I also especially enjoyed the historical note on the Carnevale d’Ivrea. No idea it existed! Yep. It’s really amazing and “small” (when compared to something like Venice or Rio). Let me know if “allergic man’s cheese” works for you guys. Looks delish! I think I will try it out on my family!!! Email me personally so I can get your email address!!! Saw your mom the other day…and hear you saw my dad….weird! Hugs!